Anti-violence campaigns have emerged as key political pressure points of LGBTQ activism since the 1960s. In recent years increased attention has been paid to the numerous murders of trans women of color. Yet, the majority of this coverage perpetuates white male supremacy by relying on a historically particular affective aesthetics of violence: visuals and texts that combine content with formal elements to further a transphobic, misogynist, classist, and racist politics of representation. This talk takes a critical look at the history of transgender, lesbian, and gay anti-violence activism to fully understand the failures of even the seemingly positive media coverage today. 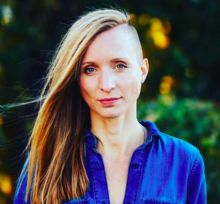 Helis Sikk is a Postdoctoral Fellow in Women’s, Gender & Sexuality Studies at DePauw University. Dr. Sikk was a 2014 Phil Zwickler Fellow at Cornell University and a Smithsonian Postdoctoral Fellow in 2016-2017. Her research takes a feral multidisciplinary approach to explore the relationships between queerness, affect, the built environment, communities, media and visual cultures. She is currently working on her monograph, which traces the affective genealogy of anti-LGBTQ violence since the 1960s. Dr. Sikk is also a co-editor for a collection of essays documenting the cultural legacy of Matthew Shepard published by Routledge in December 2018. She teaches courses on transnational feminisms, queer comics, LGBTQ memoir, and queer theory. Event will take place in the Ridenour Room (room 115) of the Dauch College of Business at Ashland University at 7pm on November 15 and is co-sponsored by Eagles for Pride.